The underside of the Bleeding Tooth Nerite shows the red spot very clearly. What a name this snail and shell has in English: the Bleeding Tooth Nerite. 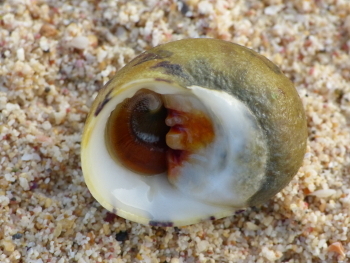 It is kind of logical though if you take a goof look at the shell this snail species builds for itself, cause it has a clearly visible blood red spot which looks very much like the spot where a child’s tooth has fallen out. The spot is located at the entrance of the shell, called the mouth plate. The scientific name for the species is Nerita peloronta and these animals are generally much larger than other types of Nerita on our shores. The upperside of the Bleeding Tooth Nerite is inconspicuous. The shell colors can vary considerably, making identification a sure thing only when the red spot is visible. The color on the outside can be black, yellow, white or pink with all kinds of patterns. No two Nerita peloronta shells are exactly the same. 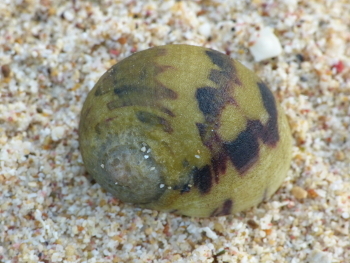 Bleeding Tooth Nerites can usualy be found on the coast, ‘stuck’ in large numbers on pieces of limestone rock in the surf area of the Caribbean sea, among several other Nerita species. The animales feed on plant material such as algae and seaweed growing on the limestone cliffs.